Siri, iMessage, and AirPlay Coming to Mac OS X? A future version of Mac OS X may bring iOS favorites Siri, iMessage, and AirPlay to Apple’s Mac lineup. Assuming the features are released, it’s unclear whether they will come as an update to Mac OS X 10.7 Lion, a purchase through the Mac App Store, or as part of Mac OS X 10.8.
iMessage & AirPlay for OS X? Rumors of iMessage coming to Mac OS X started earlier in the year when code snippets were found that suggested iChat may get iMessage integration. 9to5mac has since heard that AirPlay and iMessage for the Mac are currently in development for OS X Lion. Sources familiar with the future of Mac OS X say that AirPlay Mirroring and an iMessage application are currently in development. Although neither project may see the light of day, they are definitely on the table for release in future versions of OS X Lion. AirPlay would allow a Mac user to wirelessly mirror their Mac display to an Apple TV, and video streaming would be integrated with QuickTime. 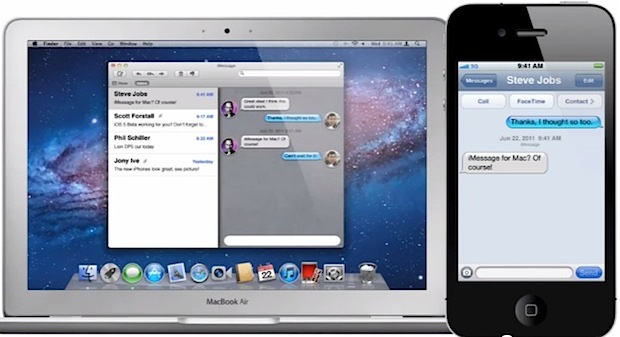 9to5mac indicates there is a possibility that iMessage will be released as a standalone product, rather than being integrated directly with the existing instant message client iChat. If standalone apps are released, it wouldn’t be surprising to have iMessage and AirPlay be downloads from the Mac App Store much like FaceTime was before it became bundled with the OS X 10.7 release. Bringing iMessage and AirPlay to the current version of OS X is similar to what Kevin Rose mentioned recently about Siri, who stated a rumor that the AI agent would be released for OS X Lion next year. Separately, we’ve also heard an unverified claim that Siri could replace the existing Speech Recognition module and have ties into Spotlight for a future version of Mac OS X. Siri would offer a significant improvement in voice recognition, dictation, and a new way to search on the Mac platform. While all of these claims are in the realm of obvious speculation, some features shouldn’t be expected to appear anytime soon. In all probability, Siri won’t be coming to any other hardware, be it iOS or Mac based, until the next generation iPhone is released. The reason may simply come down to marketing, with Siri being a prominent feature of commercials for the iPhone 4S, it’s unlikely that Apple would dilute a key marketing component of the 4S by spreading the technology around to other hardware. Other Siri related rumors suggest the AI agent would act as the remote control on a potential Apple television set. Side note: even without iMessage, you can send SMS through iChat right now just by using AIM or Google Chat and messaging a phone number prefixed with a +, although standard SMS rates apply for the recipient. MacBook Air 15″ Coming in March of 2012? AirPlay compatible TV’s coming soon? Of course these things will come to Mac OS X, iOS and Mac OS X are basically one and the same except for the interface. Remember that iOS is just a stripped and lighter version of OS X to begin with, but has the same core. Gah I hope all 3 come to OS X. It would be super useful!!! Kevin Rose hasn’t predicted anything. Siri coming to the mac is one of those “No Chit” kind of things. Like “predicting” there will be a new iPhone next year. It’s inevitable why wouldn’t they come to the OSX side of things? I really want iMessage and AirPlay for Mac OS X. Why do I need to pick up my iPhone everytime I receive a message? If those messages can be delivered on an iPad or iPod Touch, it should also be possible to deliver them on my Mac. So, if I’m just browsing the internet on my MacBook Air, why can’t I just receive my iMessages there? Why do I have to pick up my iPhone everytime a message is deliverd on the telephone? I also want AirPlay, but I don’t want to stream to AppleTV. I want to be able to stream to a Mac. In my opinion an AppleTV is too limited, so I’ve connected a Mac Mini to my television. I don’t want to be limited to streaming from my iPhone to AppleTV. I want to be able to stream from my iPhone to my Mac Mini and even from my MacBook Air to my Mac Mini. Notification Center for Mac OS X would also be nice. Just swipe four fingers down on the Trackpad and Notification Center comes in from the top of the screen, just like on iOS. Here you can see new e-mails, new iMessages, updates being available in the Mac App Store, RSS feeds. Just like Notification Center in iOS weather and stocks can be included, so actually Notification Center can replace Dashboard. Apple wants to unify Mac OS X and iOS and in my opinion Apple could have done more to make Lion even more like iOS 5. How about streaming phone calls to your Mac, so you don’t have to pick up your iPhone? When your iPhone and your Mac are connected to the same wireless network, it’d be nice to be able to make and receive phone calls using your Mac. When you receive a phone call, your iPhone just sends a message to all of your Macs which are paired with your iPhone and you’ll receive a notification on these Macs. Then you’ll be able to click the green horn in this notification or just tell Siri for Mac to pick up the phone and the phone call will automatically and wirelessly be streamed to your Mac. Address Book for Mac already includes telephone numbers. It’d be nice to be able to just click on the telephone number to start a phone call using the iPhone which is paired with your Mac. So a lot of the features that you’re asking for I want as well. Specifically AirPlay to a Mac (I have a similar setup) and being able to take calls on my Mac. Phone: There’s a program called Phone Amego. It accesses your phone over bluetooth and acts as a caller ID. You can take calls over bluetooth from what I understand but I haven’t been able to do it (haven’t really bothered, it’s not well integrated enough for it to be “fun” to use). Check those two out and tell me what you think. Next year? Is it 2012? seems few people can use Siri OSX on ship.